With the Union taking the weekend off for the international break, and Bethlehem Steel FC having a rough day on the road, the race for player of the week was wide open. 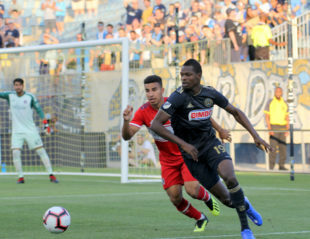 Former Union defender Ken Tribbett scored for Penn FC against visiting Atlanta 2, Philly Unity Cup Action continued with Ivorian Saydou Ba in the lead for most goals scored. People interested in the future of the Union could be excited about Aboubacar Camara’s excellent performance for the Union U-16/17s, and Lancaster native Russell Canouse has proved to be D.C. United’s second big addition of the summer. But then Jamaica played the Cayman Islands in CONCACAF Nations League Qualifying. The score was … predictable. Jamaica (the highest ranked team in the tournament) beat the Caymanian team (ranked 28th of the tournaments 35 teams) 4-0. Andre Blake was in goal and did keep a clean sheet, but the real headline went to Cory Burke. The Union striker scored two for the Reggae Boyz, including one in the 66th minute which saw him take on multiple defenders solo and still find the back of the net. Unfortunately CONCACAF is playing extra careful with media rights for this tournament, to the point that even the Union’s own coverage of the game has lost it’s video component. With that said you can see both goals (and full game highlights) of the game here, on the other side of a free login. Aboubacar Camara. The Union U-16/17 forward scored a brace against Virginia’s U-16/17 Development Academy. Time to appropriate the “scores when he wants” song for Cory Burke. Only problem is he has too few syllables in his name. We are really lucky he decided to catch fire. “other side of a free login” = hard pass. Don’t blame you in the slightest.